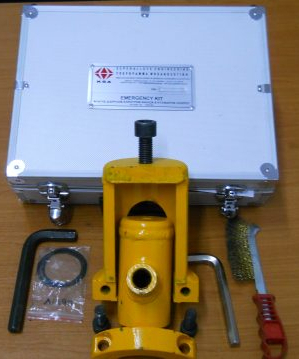 The “Chlorine Emergency Kit” is a bell shaped item, which works as a cap, for high-pressure bottles or containers and protects - blocks leakages from their damaged valves. The kit provides the possibility of placing a new valve on the container of chlorine without the dismantling of the old one that is leaking. 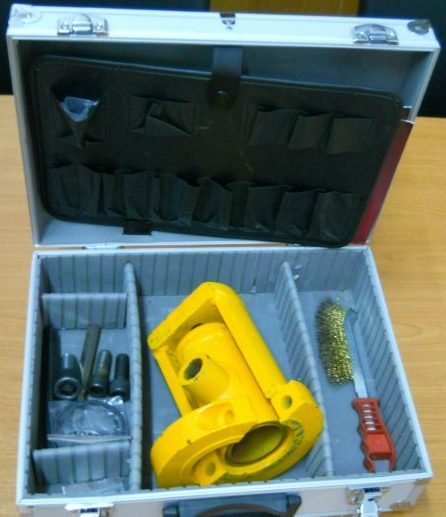 Thus allow the safe storage or transport of the container and the optional evacuation of the stored content from the new valve without the need for immediate maintenance and closure of the old valve. 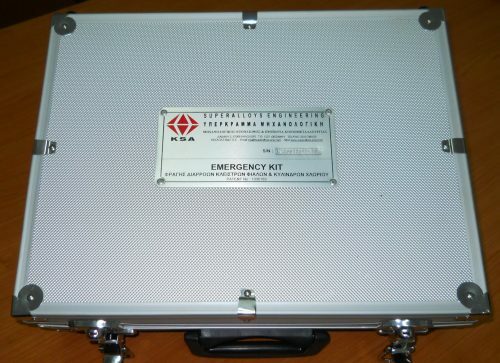 The “Chlorine Emergency Kit” consists of two parts with accessories elements and tools for rapid installation and dismantling by the bottle or container of high pressure. in order to seal the surface of the nozzle of the bottle or the pressure vessel. 2) The external, bell shaped, steel capsule : Is specially constructed from pipes and forged flange. It has a removable base, in order to embosom, the internal steel capsule.